The State of Florida is located in south eastern part of the United States. 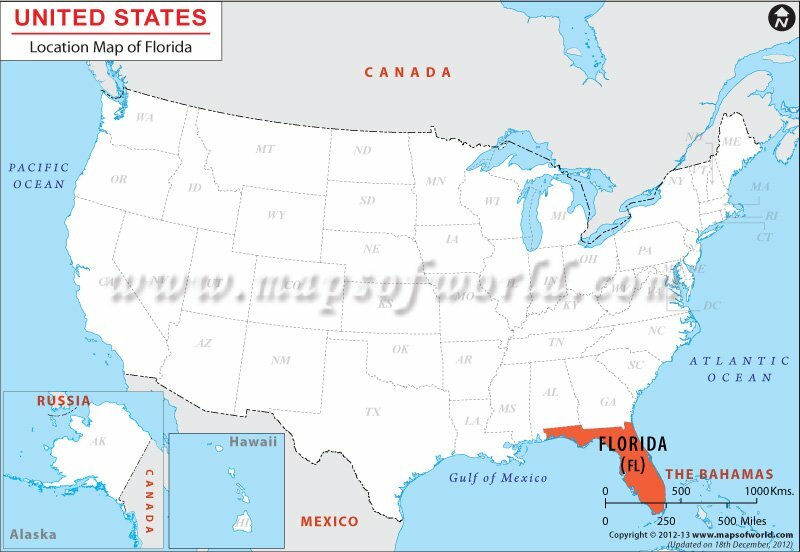 The geographic coordinates of Florida are Latitude 24°30'N to 31°N and Longitude 79°48'W to 87°38'W. The state has a total area of 65,758 sq miles (170,312 sq km) of which land area 53,625 sq miles (138,887 sq km) and inland water area is 12,133 sq miles (31,424 sq km). In the north Florida is bounded by Alabama and Georgia, towards the east it is surrounded by Atlantic Ocean, on the south by Straits of Florida and on the west by Alabama and Gulf of Mexico.